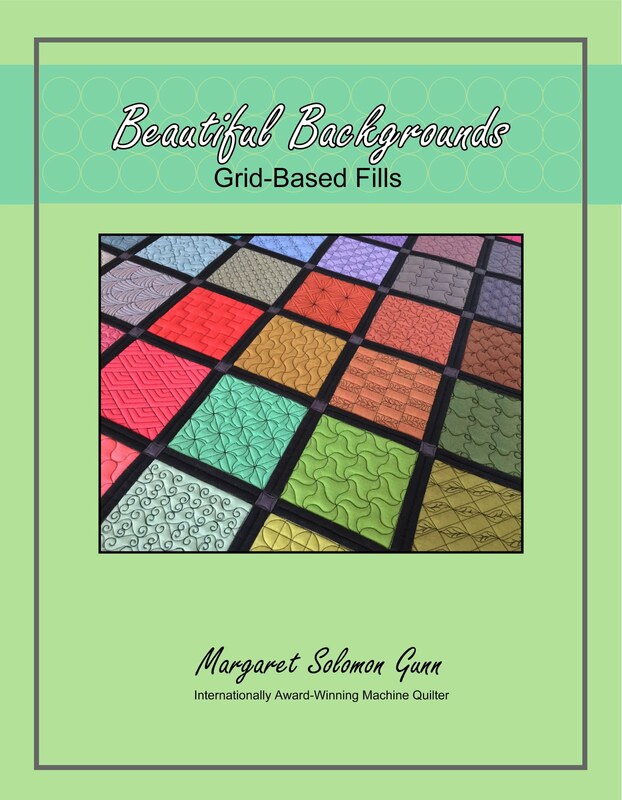 Narrow Border - Big Design Release! I am delighted to finally offer my newest book. Despite the unusual level of crazy in my life the last couple of months, I am overjoyed to have it finished and finally at the printer . 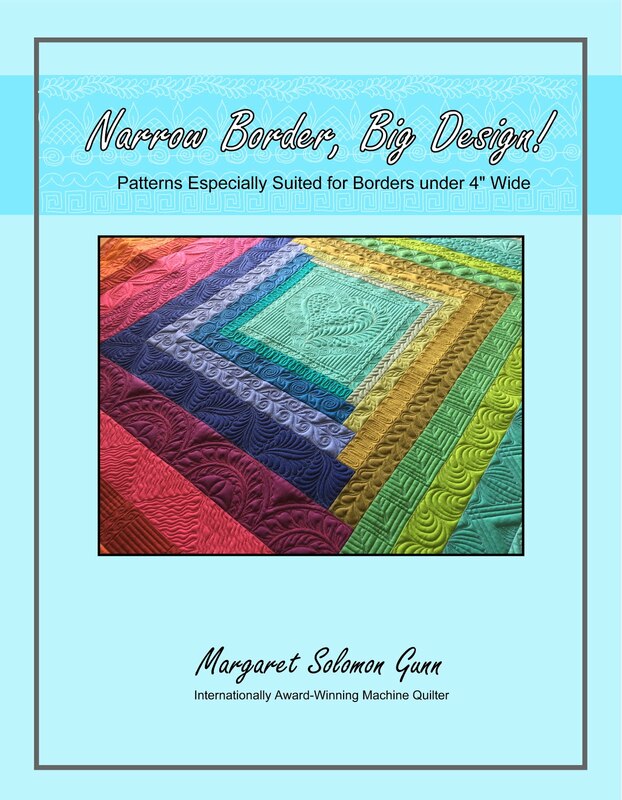 Narrow Border - Big Design presents over 100 border ideas specifically targeted for those smaller borders under ~3-4" in width. 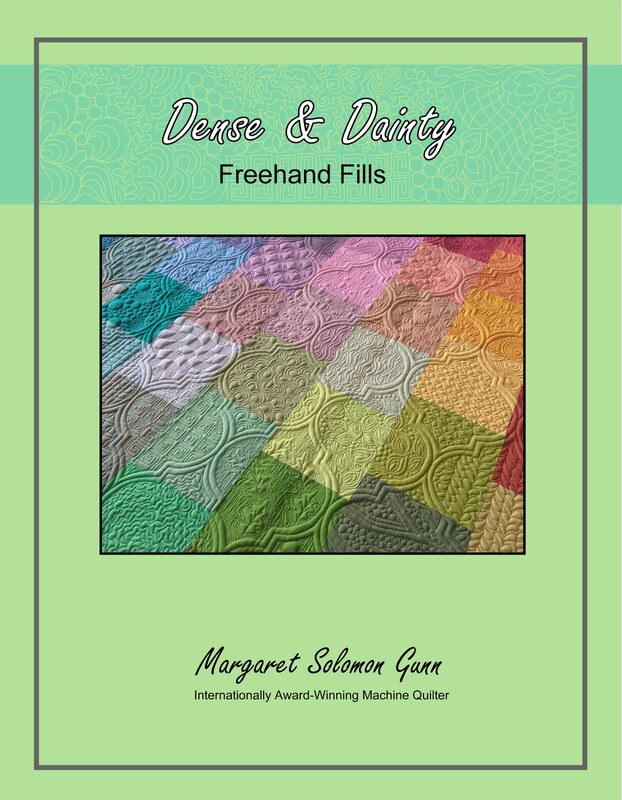 The book features freehand as well as template-based designs, feathered patterns, and my Mix-n-Match shape gallery containing dozens of cookie-cutter quilting designs that can be interchanged to create a multitude of different designs. The color book has 84 pages, and will sell for $25. Order books here. This is a presale, and all orders containing this book will ship on about July 7th. Buy More Savings...ALL multiple book orders that contain this book will receive an additional savings, processed individually at the time of shipping. Two books = 3% savings, Three books = 5% savings, 4 books = 7%. This sale is good until midnight EST July 5th. Those of you that ask questions - I am happy to answer them by email, but if you don't ever hear from me, then it is likely because you are still set to "Blogger no-reply". Go into your settings and enter your email addy. It would only be fitting since we are going on a cruise later this year that I quilt some boats. This very large quilt was 10 days on the frame, and mostly done in a flurry of last minute quilting before all 3 of my kids finished school last Friday. I spent some early mornings this week finishing it up as they were still asleep. 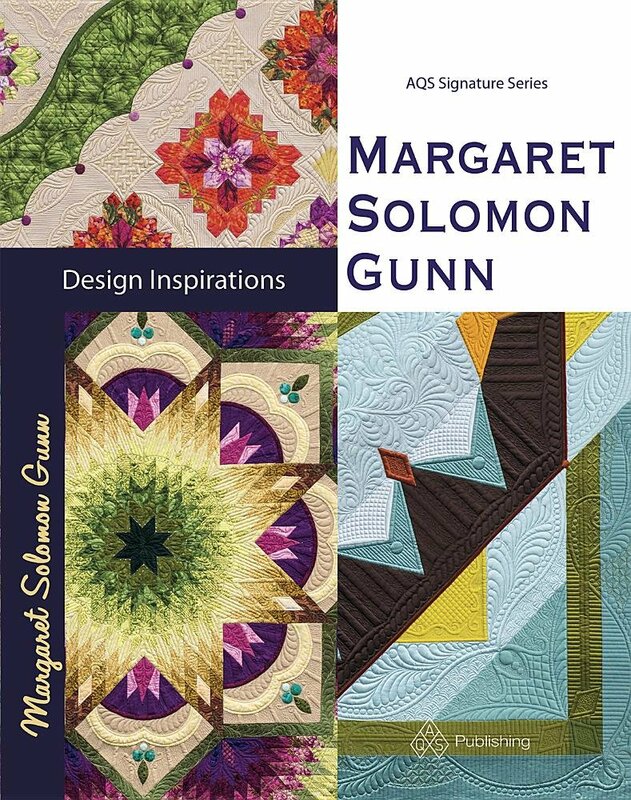 Sue Garman's Ladies of the Sea is always an impressive quilt. This is either my 5th or 6th to quilt in the last 2 years. 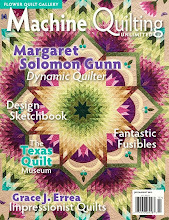 Every time I stare in amazement that anybody has the patience to quilt SO MUCH applique! And this one is another example of exceptional handiwork. The first thing I do on these is to ditch stitch the applique using a clear nylon thread. It is time-consuming...14 or so hours to be exact, but it gives every detail a crispness that you cannot get otherwise. The rest of the quilting is done in 40wt Glide thread, mostly in a tan color, but there is detail work in green and red too. I have tried to make each of these that I do a little different. Several had a quilted ray pattern like is shown here. I just wanted something other than that on this quilt. It got a windy/watery quilting. 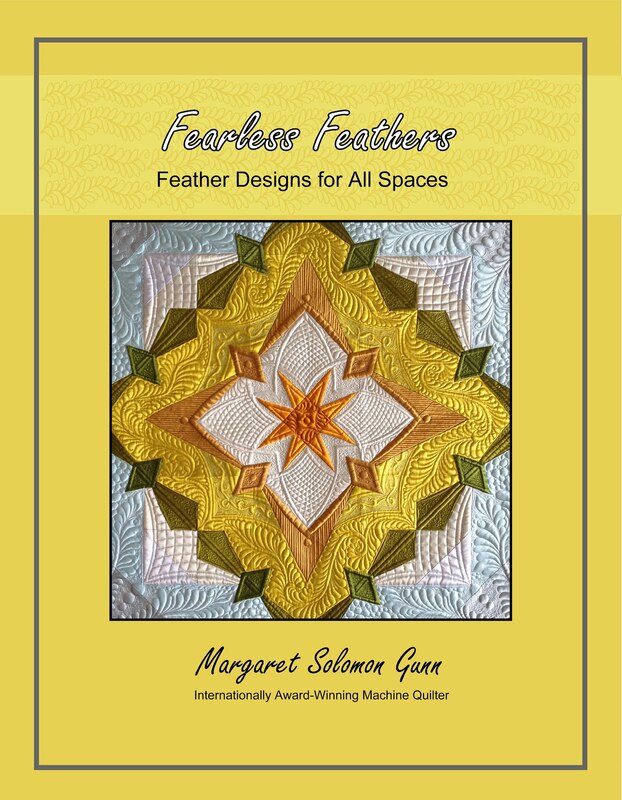 The feathered diamonds create a beautiful secondary pattern. The 10" wide borders are immense and have so much applique. It takes about an hour to ditch each one, and then nearly 2 hours to quilt the fill! The mariner's stars on the corners bring the texture of the crosshatching. 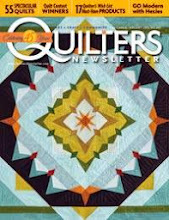 Each time I quilt this I see things I didn't the time before. Wish I had a rough number of hours that the maker spent on each block. Some of the ships have a ton of embroidery and tiny beads in the rigging. There are loads of little circles...see?!? And the backside is just as beautiful. For those wondering, my machine is home and stitches well (although this quilt does not have any fine threads). I did test quilt it using silk on my personal quilt for a day or two before I loaded this beast! I started by making 4 of these bold blocks, all by hand. The circles are silk, which just happened to coordinate nicely. Next came 4 of these. They are slightly smaller than the first blocks, and also with silk circles. Where is this going?...good question. I thought I had a plan until I laid the blocks out to confirm the color selections for the larger center block. Hmmm... Not so sure I like all of them on the gray silk. It seemed like a good idea initially, but now I'm not so sure. Then I pulled this scrap of what I "think" is grass silk Radiance. I say "think" because I really don't know. I have that many colors. Kind of thinking it might be a better background choice. Not sure, but maybe. Just ordered a few yards. I think it may be a discontinued color. It's time to make what I have work because I spent the bank on a summer vacation instead. Either way, I need to get the center block pieced and then get onto the applique for the corners - one of the two designs!